Out of all the Grati-Tuesdays this year, I hope you take a minute or a few this week to realize how blessed you really are. Dallas and I have written ours down on a poster I put up earlier this month in the hallway and it’s gotten pretty full. This week I am grateful for good health. Last week I had a miserable cold and laid in bed for three days straight. Dallas was sick before me and he handled it way better than I did. Being healthy is something I tend to really take for granted, so this year I tried to be more aware of how much of a blessing being healthy really is and appreciate my healthy body and life. But no matter how much you appreciate being healthy and thank God for it everyday, you are still going to get sick sometimes. I’m grateful that mine only lasted three days, and I am already almost better. I’m especially grateful that Dallas and I got better before Thanksgiving so that we can enjoy our time with family so much more. I hope you all have good health and a safe holiday this week! 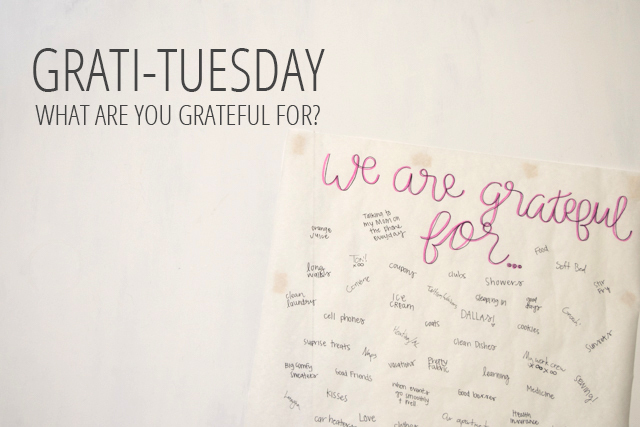 I just love grati-Tuesday! Today I am grateful for the opportunity to spend time with so much family over the course of the upcoming holiday weekend. We are so blessed to live by both of our parents and all of our grandparents, and I love that we can see all of them for the holidays. It is such a unique and incredible blessing that my children are able to know and love four great-grandmas and three great-grandpas as well as both sets of grandparents! I only ever knew one of my great-grandmas, and I know some people aren't even that lucky.